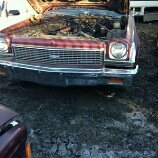 Giving you guys a heads-up on a '73 Chevelle being parted. This guy I know out in Washington state says this car is sitting at a yard near him and is clean and mostly complete. Black bench interior. Grill is nice. Interior is nice (except dash). Std square instrument panel. Edelbrock valve covers and intake (carb is missing). Let me know if interested in anything and I'll get in touch with him. Crap, that JUNKED car looks better than the car I am starting with!!! Thats too bad. It looks solid. Thats a pretty clean one. Quarters look good. And still has some shine. Wonder if it has duals on it. Exhaust pipe looks clean. Whats with the exhaust? that is one of the worst fitting tailpipes i've seen. Thats what made me think it might have duals. Might be a "kit" exhaust. Someone should grab the black seat belts for it. And see if it has the courtesy map light above the rear view mirror. One pink wire on the back of that and it just plugs into the fuse block. i see someone already got the stainless 1/4 window trim. I already had him check the door rockers for you. One side had a few shallow dents and the other (think it was the driver side) had some scrapes/creases at the back end. It's so hard to make a judgement call as to whether any of these we find will be acceptable...as we've discussed; especially out in a junk yard where they are dirty and dull. I'll have him double-check them and get some pics. Yes, Limey...I'll have him look over the wheel well moldings and report back to me. 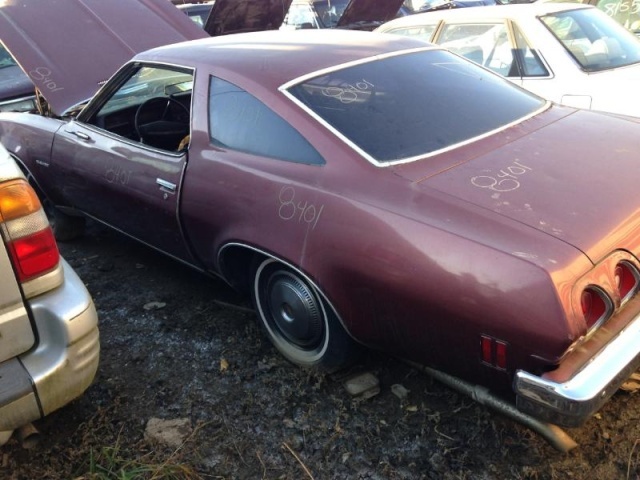 Silly question(probably gone) but does it have a decient trunk chevelle emblem? Emblem is on there. I have another pic on my cell phone that shows it. Can't tell what condition it's in...but, being a Western car, I'd bet it's nice. Want me to have him check? Mcarlo77 wrote: Yes, Limey...I'll have him look over the wheel well moldings and report back to me. Mcarlo77 wrote: Emblem is on there. I have another pic on my cell phone that shows it. Can't tell what condition it's in...but, being a Western car, I'd bet it's nice. Want me to have him check? Yes that would be great! I have been looking for a decent one for a while now. Please pm me when you find out . I'm intrested in the taillight panel too if its solid. He was going to try and swing by the yard this week and will grab the emblem if it's good. Mcarlo77 wrote: He was going to try and swing by the yard this week and will grab the emblem if it's good. I am interested in the gauges and tac. mine was stolen couple years back when I took them out of the dash to do some mods. (new wiring) let me know if you still have them. also the bezel. No tach gauge cluster in this one...sorry. The guy was going to try getting out to the yard this week...but, not sure he realized it was Thanksgiving week. Also, the car is not up off the ground, so he's not sure he can access the underside. He'll check with the yard to see if they can't get it up in the air a little. I'll keep you posted. Any word on the trunk emblem? ?